After months of waiting, Hulu has released the The Handmaid's Tale Season 3 trailer. The streaming platform announced that they were participating in the Super Bowl madness this year when they released a ten-second teaser earlier this week. Though the teaser was only a few seconds long, it got fans ready for the main course, which is 30-seconds of pure drama. With that being said, the Emmy Award-winning series looks darker and more oppressive than ever before, which is exactly why fans are excited for the show's return. As with the first teaser that was released, the The Handmaid's Tale Season 3 trailer that dropped during Super Bowl is dark and features the hint of new threats. The series goes well beyond the dystopian world created by Margaret Atwood in her iconic 1985 novel of the same name. Atwood imagines a version of America reshaped by a far-right religion-based system that seeks to stamp out individuality, while also stripping away the rights and freedoms of women. It's incredibly bleak and one can sadly see some of it happening in real-life. Elizabeth Moss' June nearly made it out of the dystopian hell in the The Handmaid's Tale Season 2, but a lot went down, preventing her from doing so. June is shown in a new color instead of her normal red in the latest trailer, meaning that she will become a Martha in Season 3, which is a big step down in society's view and much different from being a handmaid like she was in the first two seasons of the hit show. However, a lot can happen in a season, and it looks like June is in for a lot of trouble this time around. It's not clear at the moment how June will become a Martha in The Handmaid's Tale Season 3, but the teaser and trailer both seem to confirm that she will have that new role when the show starts back up again. This brings up several questions, but the main one has to revolve around June making the change out of her own freewill. Perhaps she thinks that she can more easily find her daughter? Again, everything is up in the air at this point, but we should all find out pretty quickly. For the third year in a row, Hulu has featured an original series in their Super Bowl ad. The 30-second spot aired during the first quarter of today's game and gave viewers a sneak peek into season three of the dystopian series The Handmaid's Tale. The Super Bowl ad kicks-off the season three marketing campaign for the award-winning Hulu Original. The Handmaid's Tale spot takes inspiration from Ronald Reagan's iconic "Morning in America" campaign commercial to creatively set-up the storyline for the upcoming season, which features themes of optimism, hope and renewal as characters attempt to take a stand against Gilead. The first sneak peek into season three shows the heroine June sharing a bold call to action for America, the country Gilead was born out of, to "Wake Up." Season Three of The Handmaid's Tale is driven by June's resistance to the dystopian regime of Gilead and her struggle to strike back against overwhelming odds. Startling reunions, betrayals, and a journey to the terrifying heart of Gilead force all characters to take a stand, guided by one defiant prayer: "Blessed be the fight." The spot follows last year's Super Bowl spot which introduced the world to Castle Rock and comes on the heels of Hulu's growth to more than 25 million U.S. subscribers. Below is a link to the full 30-second spot that aired during the first quarter of today's Big Game. In the Handmaid's Tale, the Marthas are domestic servants to wealthy families within Gilead. This new role for June could mean that she will no longer be sexually assaulted on a regular basis like the normal handmaids. The Marthas are mostly infertile and seen as a minority in the dystopian society, therefore they are looked down upon. Regardless, there's going to be a lot to unravel when Season 3 premieres later this year. 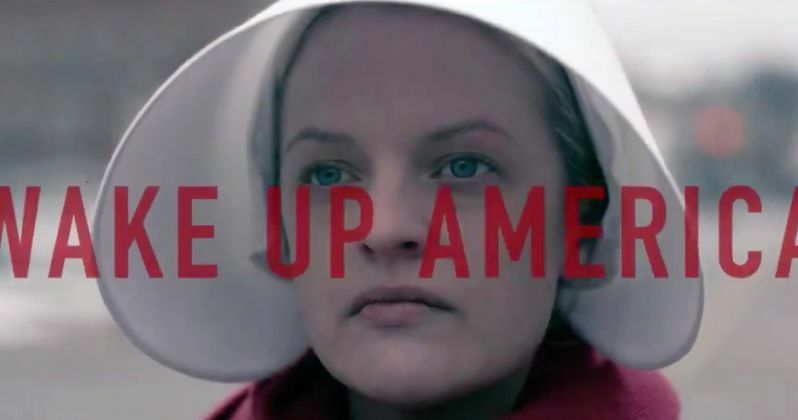 For those of you who weren't watching the Rams and Patriots battle in the Super Bowl, you can check out the Handmaid's Tale Season 3 30-second trailer below, thanks to Hulu.